Join Eye Doctors of Chester County in Thorndale, PA this weekend for the GIANT Main Line 5K Run/Walk! Proceeds benefit the Main Line Emergency Responders Scholarship Program. Levin Luminais Chronister Eye Associates are excited to be opening our new office in Berwyn, Pennsylvania. Our patients will be seen, as always, for all manner of eye conditions: glaucoma, dry eye, diabetes, cataracts, testing for eyeglasses and contact lenses. Routine eye exams will also be available in our new Berwyn office. Back to School With Contact Lenses! It's that time of year again, when children get their annual eye exams and head back to school. Many parents are unaware that children can wear contact lenses successfully and many don't fully recognize their benefits. Did you know that teens and even children with a need for vision correction may ultimately perform better in the classroom, on stage, or the athletic field by making a small change and replacing their glasses with contact lenses? Dr. Luminais attended in October the largest meeting of eye care professionals in the world in the greatest city in the world: the American Academy of Ophthalmology meeting this year in Chicago. I was amazed walking into Wills Eye Hospital last week. The Cataract and Primary Eye Care service (CPEC) where I teach at Wills has been completely remodeled and re-outfitted with new equipment. Tear film is complex! Comprised of mucus, water, minerals and oils, tear film in the healthy human eye should nourish structures on the front of the eye and keep our eyes comfortable.rnrnAn inadequate tear film will cause discomfort, such as a scratchy feeling or the sensation of a foreign body in the eye. Dry eyes can affect anyone at any time, but we are more susceptible during cooler and drier times of the year. Since these symptoms can overlap allergy symptoms, we might mistakenly think we are simply affected by allergy season, when in reality the problem is Dry Eye Syndrome. 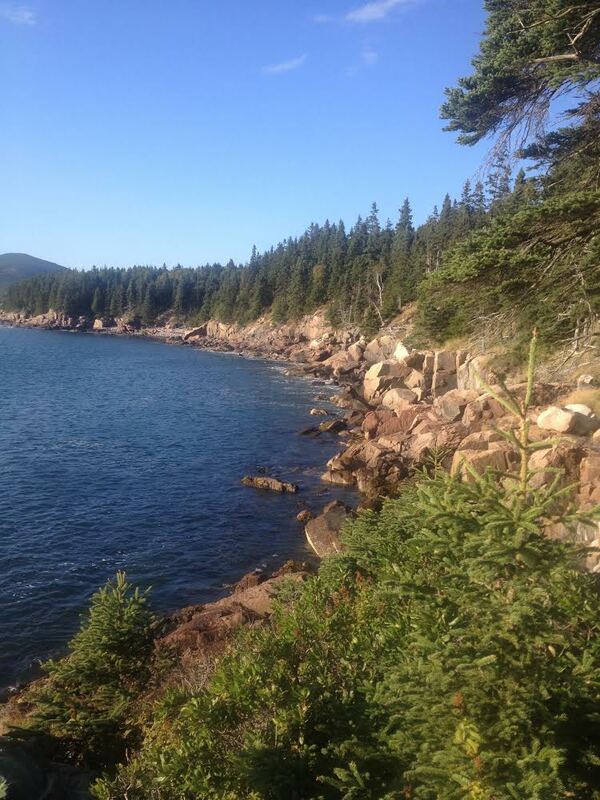 On a recent, beautiful autumn weekend, Dr. Luminais traveled to Bar Harbor, Maine for The 13th Annual Downeast Ophthalmology Symposium. Outstanding speakers in a beautiful setting make this a nice meeting to attend in the fall.rnrnGlaucoma was a hot topic. Visual field testing and optic nerve imaging occupied a significant amount of time as well. These are big factors in the care of glaucoma patients, so different points of view expanded horizons. Everyday hundreds of patients are diagnosed with Age-Related Macular Degeneration (AMD) in the United States. AMD is the leading cause of legal blindness in Americans over the age of sixty-five. The macula is responsible for our sharp central, detail vision which we use to read, see colors and safely drive a car. The damage and deterioration to this area of the retina creates distortion and a blindspot in the center of a person’s vision which makes it very difficult for a person to read, see faces, and see to do other daily activities.rnrnThere are many risk factors which have been identified for developing AMD. These include: age, fair skin and light colored eyes, family history of AMD, smoking, lifetime sunlight exposure, farsightedness, cardiovascular disease, and high cholesterol. Macular degeneration can be in two different forms, “dry” and “wet”.rnrnThe “dry” form of macular degeneration is a slowly progressive vision loss that results from a deterioration of the macular region. Dry macular degeneration is usually a much slower loss than the “wet” type. However, some of those with “dry” AMD will develop “wet” AMD. Dry eyes! Blepharitis!rnrnCommon conditions we run into on a daily basis. Yet these chronic conditions can be stubborn to eradicate and frustrating for patients to manage. That’s why the experts at Levin Luminais Chronister Eye Associates are constantly striving to stay on the leading edge of evolving remedies for these recurring problems.rnrnWe are proud to introduce yet another innovation for the treatment of ocular surface disease: BlephEx! Low vision means that even with regular glasses, contact lenses, medicine or surgery, people find everyday tasks difficult to achieve. Most people develop low vision because of eye diseases and health conditions like macular degeneration, cataracts, glaucoma, and diabetes. Some develop vision loss after eye injuries or from birth defects.rnrnThere are many ways that eye diseases can affect vision. Depending on the cause of vision loss, symptoms can range from hazy or foggy vision, sensitivity to light, and distorted or wavy vision. Lighting conditions and daily variations can occur causing one to have “good days and bad days” with their vision. Additionally, patients report “come & go” or “now I see it, now I don’t” vision. This is because they are experiencing a blind spot in their vision. For all of these reasons, activities such as reading, shopping, cooking, seeing the TV, and writing can seem challenging. Glaucoma is a leading cause of blindness in the United States and January is National Glaucoma Awareness Month. There are different types of glaucoma, but the most common type in this country is open angle glaucoma. Open angle glaucoma occurs when the pressure in the eye is too high for that particular eye to tolerate. This high pressure causes characteristic changes in the optic nerve (the cord between the eye and the brain).rnrnUnlike other blinding eye diseases which cause a patient to have symptoms, glaucoma is often asymptomatic. The patient does not notice that he/she is losing vision because glaucoma usually causes progressive peripheral vision loss that can occur slowly over years. As a result, patients do not realize that they are losing their peripheral vision. This vision loss is preventable by detecting glaucoma early, which can be accomplished through a comprehensive eye exam. Glaucoma is a condition of optic nerve damage generally associated with elevated pressure inside the eye. Glaucoma is very treatable; it does best to treat it early, before extensive damage is done.rnrnThere are four broad categories of treatment for glaucoma. Many patients use eye drop medication to manage and treat their glaucoma. Surgery and pills are two other options, but those are usually used when all else fails. The fourth option is a laser treatment called SLT, Selective Laser Trabeculoplasty.rnrnAn SLT works in this way: there is a regular circulation of fluid inside the eye. This fluid is produced in the ciliary body, and it percolates out through a microscopic drain. The most common form of glaucoma, open-angle glaucoma, occurs because the body deposits material which partially blocks the drain. The most natural and safest treatment is a very low energy laser treatment which stimulates the body’s immune system to clean up the drain. This is a common first-choice treatment for most patients. Recently Dr. Steven Luminais attended the European Society of Ophthalmology meeting in Copenhagen, Denmark. Held in the state-of-the-art Bella Center, the meeting was small by American standards, but the intellectual rigor was absolutely first-rate. The major issues, naturally, were quite similar to what one finds at major American meetings, but a few topics were approached from a slightly different angle. When taken reliably, and with periodic monitoring of the results by office visits 3 or 4 times a year, most (but not all) can be successfully managed.rnrnHowever, one of the most frustrating situations in Ophthalmology is caring for glaucoma patients who seem to be poorly controlled despite our best medicines or even laser. The surgical treatment for glaucoma has existed for over a century, but has failed to get the spotlight due to the difficulties in balancing the benefits with the risks. If there were a simple, risk free, operation which could offer lasting control of the intraocular pressure for the life of a patient it would have many advantages over the approaches we favor today. Today is American Diabetes Association Alert Day. Diabetes affects many organs in the body including the eyes. In fact, diabetic eye disease is the leading cause of blindness in working-age Americans and all diabetics should have a yearly dilated eye exam. Diabetes causes many eye problems including cataracts, glaucoma, diabetic retinopathy, macular edema, retinal detachment, and double vision. Vision loss from diabetes is often a patient’s first symptom, but vision loss usually does not occur until late in the disease process. Early stages frequently do not cause any symptoms and that makes screening diabetic eye exams even more important.rnrnAt Levin Luminais Chronister Eye Associates, our doctors have over 100 years of combined experience in diagnosing and treating diabetic eye disease. If you or a family member are diabetic and have not had a dilated eye exam in the past year, please call today to schedule an appointment! You may also find more information about diabetic eye disease on this website under “Eye Conditions” and under “Videos” (Note: Diabetic eye disease is found under the “Retinal Conditions” tab of the video section). Beginning in January 2013 LLCEA instituted a Jean Day once a month, the 3rd Thursday of the month. In order to wear jeans to work for that day employees of LLCEA donated $5.00 to a charity that had been designated. The charity that would receive the money for the first three months would be Chester County Blind Association. The second quarter will be March of Dimes, since one of our employee’s grandchild was a premature baby. The third quarter has yet to be determined and the fourth quarter will be Diabetes. All employees are encouraged to participate whether they wear jeans to work or not. Welcome to our blog! Within this regularly updated feature of our website, we will provide visitors with practice news and specials, as well as information regarding the most recent technological advances and new treatments in vision care.